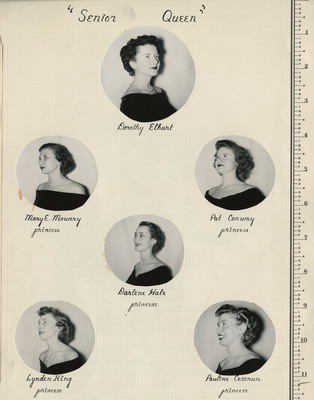 This is an image of the "Senior Queen" page of the White Caps Good Samaritan School of Nursing Annual of 1951 featuring, from left to right: Dorothy Elhart, Mary E. Mowery, Darlene Hale, Pat Conway, Lynden King, Pauline Cessnun. The "Senior Queen" Page of the Annual is missing photographs, as demonstrated by the yellow adhesive stains on the page. Please see the Related Resource field to view the photographs associated with this page. White Caps Staff, "The "Senior Queen" Page of the Annual" (1951). Good Samaritan School of Nursing Photographs. Image. Submission 203.